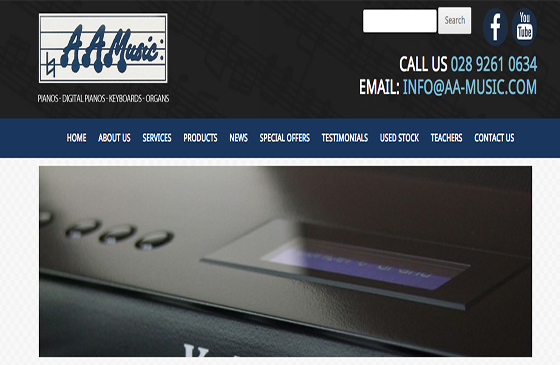 AA Music is one Northern Ireland’s longest established piano dealers & music shops. With a reputation spanning over a quarter of a century, a strong emphasis on quality and a family’s commitment to customer service, A A Music is the choice for everyone from Student to Accomplished Pianist seeking their piano. From upright to grand, acoustic to digital and from reconditioned to new, AA Music has the piano for you. AA Music specialises in sales of new and used – Upright, Grand and Digital pianos and are official stockists of Kawai, Yamaha, Samick, Steinmayer and Casio among others. A.A Music are also official suppliers of pianos to the Education Boards of Northern Ireland. They deliver throughout Ireland, whether it be Belfast, Lisburn, Dublin or beyond can get your piano or other instrument to you. All their pianos are Tuned, Regulated, Delivered and Guaranteed. As well as Pianos, AA Music sell Guitars, Keyboards, Violins, Church and Home Organs and more and offer a Piano Hire Service, if required.